When I was a kid, I was force fed Spam by my lovely mother because she kept telling me that it was a "different kind of ham." Thanks, Mom. You gave me my first taste of salty, porky products. Perhaps this is why we're all porky! Now that I'm an adult, you couldn't pay me to eat this meat-in-a-can. In the old days, the tin used to come with a key at the bottom that allowed you to open up your "meat." I say that anything that you have to open with a key should be considered a non-food item. Luckily for my folks, there is now an easy-open pull tab. Does this make it more real? I doubt it. THE VERDICT: "It tastes better than it sounds," says Mom. Being a canned product, Spam is very salty. The lite version fortunately has less salt, and tastes exactly the same as the regular version. 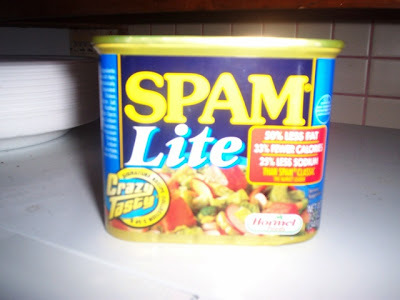 Americans have a love/hate relationship with Spam - some people like it (parents), and some don't (my sister and I). Mom says that Spam was invented as a cheap substitute for meat during the war when the real meats were scarce. Even though Spam is made with the bits and leftovers of pork butts and God knows what else, my parents say that it's really not that bad. What I didn't know is that people in Hawaii live by it! They fry it with eggs for breakfast, put it in a bun for lunch, and serve it with sides for dinner. Who knew? I guess the bottom line is that Dad loves it, Mom likes it, I won't eat it, and Mallory would kill herself before even bringing it into her apartment. Maybe I'll get brave and give it another shot. What's the worse that can happen? I won't die ... right? I'll just be guzzling water for the rest of the night.